Maui Arts & Cultural Center's Artists in the Community program redefines the relationship of artist to audience, and embodies The MACC’s enduring belief in the ability of the arts to build community. 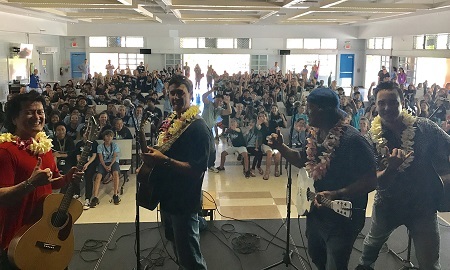 Through a multitude of free events throughout the year, The MACC brings performing artists into local schools, senior centers and social service agencies, reaching out to people throughout Maui County in the places where they live, go to school, or gather to socialize — including Hāna, Lāna‘i and Moloka‘i. 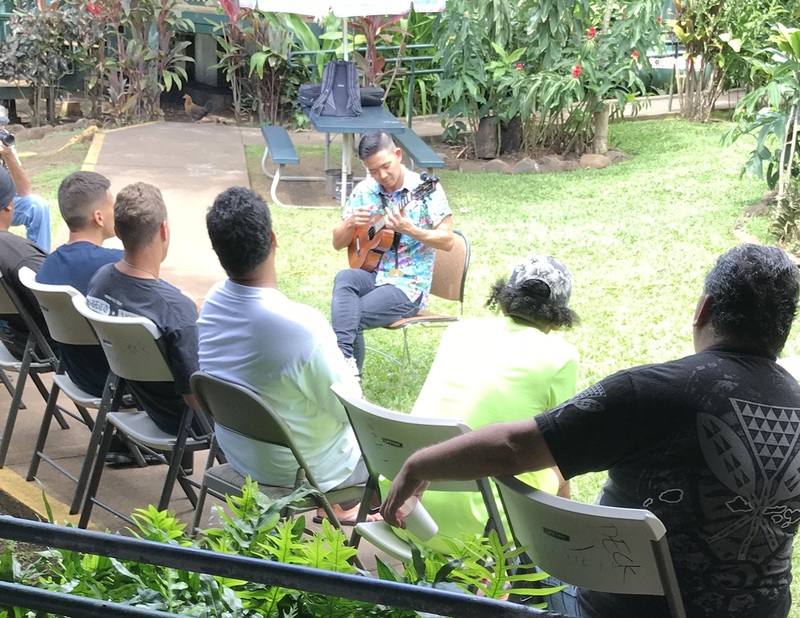 Through shared personal experiences with performers from around the world, Maui Nui residents experience the transformative power of the arts. In return, our visiting artists feel the strength of aloha from our community. These engagement activities provide shared benefits: the ‘aha’ moments that occur not only enrich the community, but are also insightful for the participating artists ... and therein lies the potential for great exchange, sharing and growth. 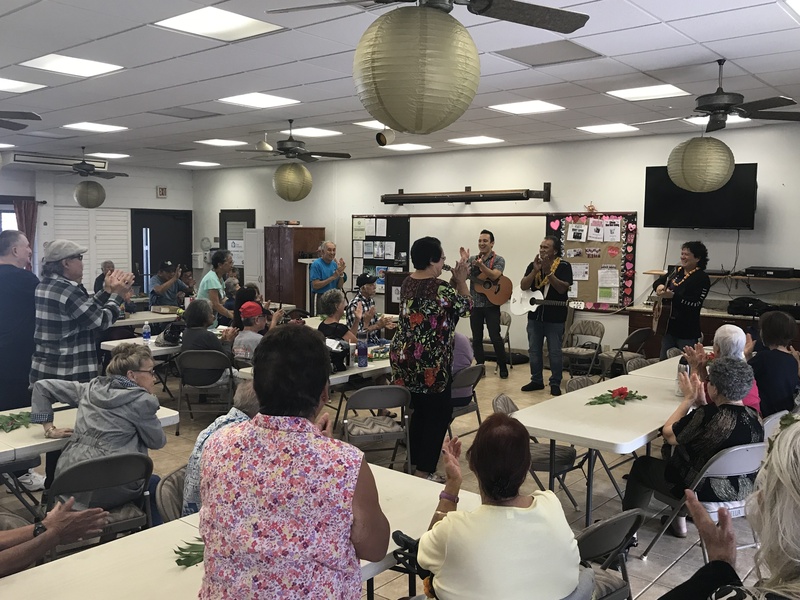 THE NUMBERS: 3,733 people were served throughout Maui County, with 35 events in the MACC's Artists in Community program 2017-18 ... taking place in community centers, social agencies, and schools. Morgan Thorson and Collaborators will present the company's dance performance entitled "Public Love" on Wednesday, March 20, 2019 in the Castle Theater. This program was co-commissioned by the MACC and Walker Art Center in Minneapolis. - Roselani Place, an assisted-living community, where he serenaded the seniors during their lunch. - Aloha House (provides outpatient and residential treatment to individuals with addictions and comprehensive, family-centered behavioral health interventions). - Participants onsite with P.O.I. Program: Positive Outreach Intervention (assists juveniles who are learning about the consequences of negative choices) and the KALO Program (culturally-based curriculum to assist families with communication and parenting skills, building self-esteem, and making healthy choices) Both programs facilitated by Maui Police Department. Building on the stage production covering "The Overthrow," presented last year in McCoy Studio Theater and in our AIC program l, the cast of Mai Poina travelled to Kamehameha School-Maui to present the historical drama along with a discussion session with Hawaiian scholars. 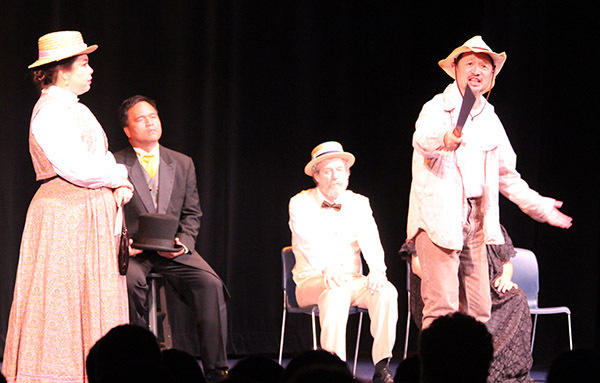 "Mai Poina: The Annexation Debates" is a reenactment of the arguments that raged during 1898 about the annexation of Hawai'i by the United State, with the aim to make history relevant to a diverse audience and illustrate the impact then and now. Redeaux! 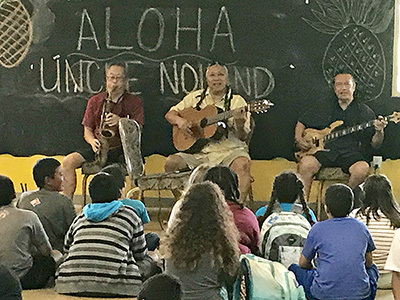 Henry Kapono and his friends/bandmates Alx Kawakami, Blayne Asing, and Johnny Valentine visited Kalama Intermediate School, Aloha House, Hale Mahaolu Elua/Akahi senior center, and Ke Hale A Ke Ola Resource Center in Wailuku. 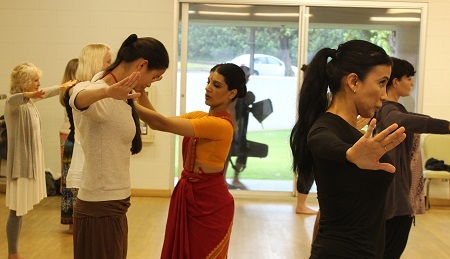 Based in Minneapolis and specializing in the Odissi dance form of India, the celebrated Ananya Dance Company conducted a Master Class for dancers in the Omori Studio. They also visited UH-Maui College where they participated in a discussion with Associate Professor Kahele Dukelow and a group of students about feminism and the different challenges, and success stories of our community; and traded cross-cultural dance moves with Halau Kamaluokaleihulu. Rob Faust took his collection of characters ( composed of just masks and body language) to Kamehameha School for a workshop with theater arts students. 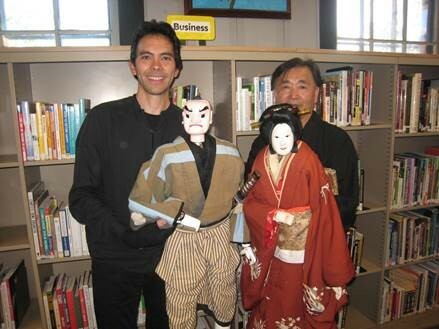 Our Artists in the Community program in September featured an astounding number of residency activities with 5th-generation Japanese puppet master Koryu Nishikawa V and Hawai'i-born puppet artist Tom Lee. Their production, Shank's Mare (in the Castle Theater Sept 29) is only the top of the glacier of activities: over 1,800 children and adults in Maui County benefitted through three free community performances in Hana, Moloka'i and Lana'i and presentations by the cast in schools in those locations, as well as a special show for schoolchildren in Castle Theater at MACC. 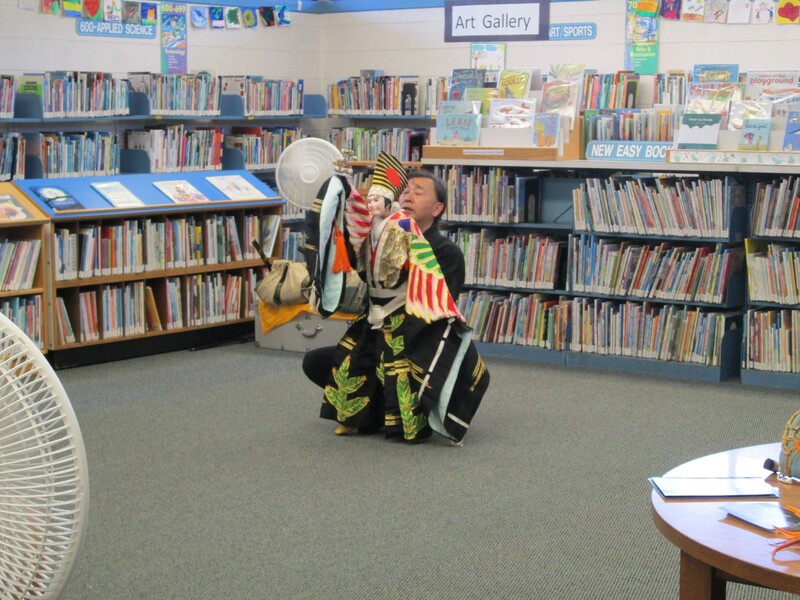 Nishikawa and Lee also presented lecture-demonstrations in libraries statewide - including Kahului, Moloka'i and Lana'i - sponsored by the Performing Arts Presenters of Hawai'i, of which MACC is a member. The evening of June 22, Maui Arts and Cultural Center in partnership with Lana‘i Culture & Heritage Center hosted a free community performance by Moses Goods (Maui-born actor, writer and storyteller) at Lana'i school: presentation of traditional Hawaiian storytelling, and performing arts. Moses Goods also enacted a similar program on Moloka'i: educational presentation and a free community performance. Whenever we get a chance to take our performing artists out and around Maui - WE DO IT! Sometimes it's for one session, and other times it's more - like last Thursday, it was FOUR sessions. All day long. All in. All around Maui. 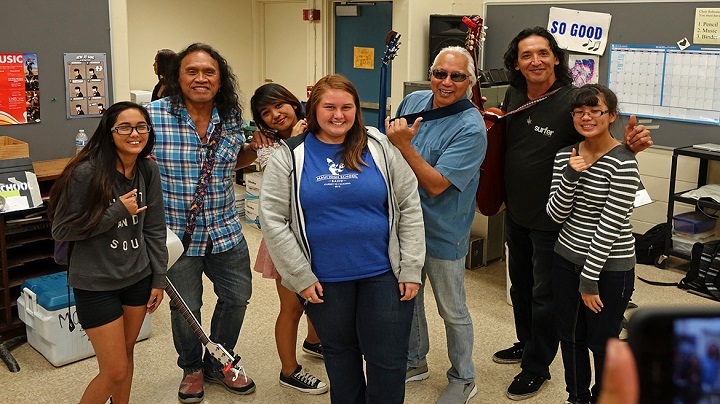 Henry Kapono and his friends/bandmates Alx Kawakami, Blayne Asing, and Johnny Valentine visited Maui High Band and Choir students in Kahului; Aloha House - Substance Abuse Services in Makawao; Lokelani Intermediate School in Kihei; and Ke Hale A Ke Ola - Homeless Resource Center in Wailuku. Dancers from Alvin Ailey's renowned dance campanies taught a master class here in the Omori studios ... and conducted a Q&A with audience members after their performance ... and appeared for an aftershow meet & greet with a couple dozen young Mauians associated with the Queen Liliuokalani Trust. Taught a class in Omori Studio on the classical Indian dance form, Bharatanatyam. Their master class in the Omori Studio was for "Terrified beginners"! Members of the Sean Dorsey Dance company also conducted a community talk night with members of the Maui AIDS Society. The evening before, Rosie taught a workshop at MAPA (Maui Academy of Performing Arts) with intermediate to advanced level dancers (and even a couple of instructors!) “Audiences connect to people who have experiences and take risks in their performances,” as she told the young performers. Horn Clinic with five horn players from the Los Angeles-based band Big Bad Voodoo Daddy with King Kekaulike High School Jazz Band student musicians. Glen Marhevka (trumpet), Andy Rowley, saxophone), Karl Hunter (clarinet & saxophone), Alex Henderson (trombone), and Tony Bonsera (trumpet) visited the Upcountry high school to share pointers on musicianship, horn-playing, and being part of a performing team. The musicians sampled some of the various types of jazz music, listened to a few pieces by the King K students and gave the students a few tips ... and then everybody jumped in and jammed on a tune together! Many of the kids came to the perfromce in the Castle Theater the next night, and hooted & hollered for their new best friends and fellow horn players! King Kekaulike High School band instructor Casey Nagata had this to say: "The horn clinic was an amazing experience for my students and we're extremely grateful to Art and the MACC for giving us this opportunity. Being able to go to Tuesday's concert for free really made the students feel special and helped solidify and give context to what they had learned on Monday. At this age and with all the other electives, sports, video games, and activities competing for their free time, it's really important for young musicians to see and hear real live professional musicians to keep them inspired and excited about music. On top of that, it's great to have pros who want to outreach to the schools. Once my band could tell that BBVD was genuinely interested in them, they lost their nervousness and started having fun." 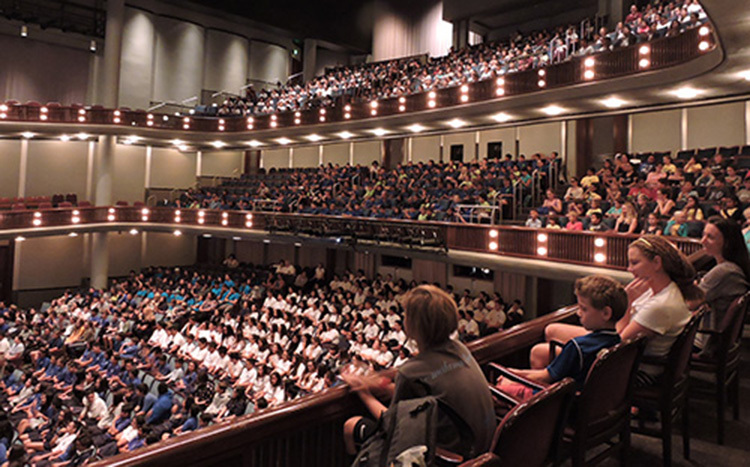 A thousand Maui school children packed the house for a School Show of the Hawaiian language story "Paka'a Lanakila" ( Paka'a the Winner), narrated by B.K. Cabigon accompanied by the Wind Quintet of Chamber Music Hawai'i, in an original composition by Jon Magnussen. This performance was a collaboration of cultures: a quintet of wind instruments gave a musical translation of an ancient Hawaiian tale from Kaua'i, while a narrator told the story in Hawaiian, and an English translation was projected so that all the audience might enjoy the 'olelo. From the staff: "There really is nothing like hearing the Castle Theater full of all those excited young voices as they get ready for the lights to dim and the show to go on!" Hawaiian storyteller Lopaka Kapanui gave a performance of spooky stories for about 25 'tweens' at the Boys & Girls Club in Makawao, and visited Hale Mahaolu Elua where he told stories to about 75 kupuna. (Some of the eldsters came special from Hana and Kula to see his performance - and they had a great time!) What a way to get ready for Halloween weekend on the island: chicken-skin! A theatrical production brought to life by the Hawai‘i Pono‘ī Coalition, telling of the tumultuous last four days of the Hawaiian monarchy from the perspective of native Hawaiians and other citizens of the kingdom. Followed by an open discussion with Hawaiian scholars, to inform and inspire. The cast from O'ahu performed this dramatic work to a full house of students in the McCoy Studio Theater - approximately 300 young people who had come to the MACC for this school show. 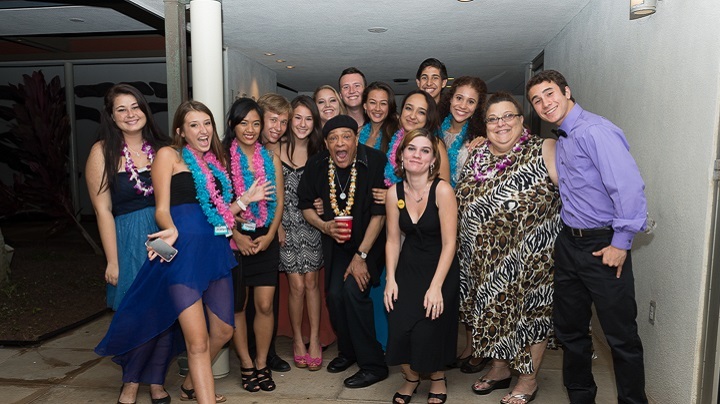 Immediately after, the cast traveled to Kamehameha School Maui to perform for all students in the high school and eighth grade, approximately 560 students. Nyla Fujii-Babb, who plays the role of Queen Lili`uokalani in Mai Poina: The Overthrow, was full of emotion for the impact of these performances, as she felt so strongly that they were reaching the audience for whom this presentation was most intended - the youth of Hawai`i. Henry Kapono, Brother Noland and John Cruz ... WATCH THE ROUGH RIDERS VIDEO: "A Day of Aloha"